Gryba’s trade deadline serenity took a hit when he looked at his phone to find an alarming series of text messages from his wife, Cate, last week. A few years ago while with the Ottawa Senators, Gryba impatiently watched the trade deadline coverage. He had been rumoured to be on the move and his name was among the top-10 on TSN’s trade bait list. There was no such gossip last week, even thought the 28-year-old physical defenceman from Saskatoon is eligible to become an unrestricted free agent last week. But then all of sudden Gryba’s serenity took a hit when he looked at his phone to find the following series of text messages from his wife, Cate. Cate was back in Edmonton as her husband dined with friends in St. Louis. He didn’t dare look at his phone as he caught up with one of Cate’s bridesmaids, Whitney Ashton, and her husband Chris. What had happened during dinner was one of Gryba’s closest friends, Brenden Dowd, back in Saskatoon had come across a rumour that Gryba had been included in a package of players traded away by the Oilers. Dowd decided to call Cate to see if what he heard was true. Cate tried to reach out her husband and increasingly became annoyed when there was no response. The 6-foot-4, 228-pound Gryba has experienced first-hand the disappointed of being traded. He was moved at the 2015 NHL draft from the Senators to Edmonton in exchange for a fourth-round selection (Christian Wolanin) and minor-league forward Travis Ewanyk. It was a difficult development to endure. After winning a Telus Cup national midget championship with the 2004-05 Saskatoon Contacts, the Senators drafted Gryba in the third round (68th overall) in 2006. He went on to win a NCAA Frozen Four championship with the 2008-09 Boston University Terriers and teammates Nick Bonino, Kevin Shattenkirk and Colin Wilson. He developed in the Senators system and celebrated yet another big title with the 2010-11 Calder Cup-winning Binghamton Senators. The AHL championship was his third league crown in six years. 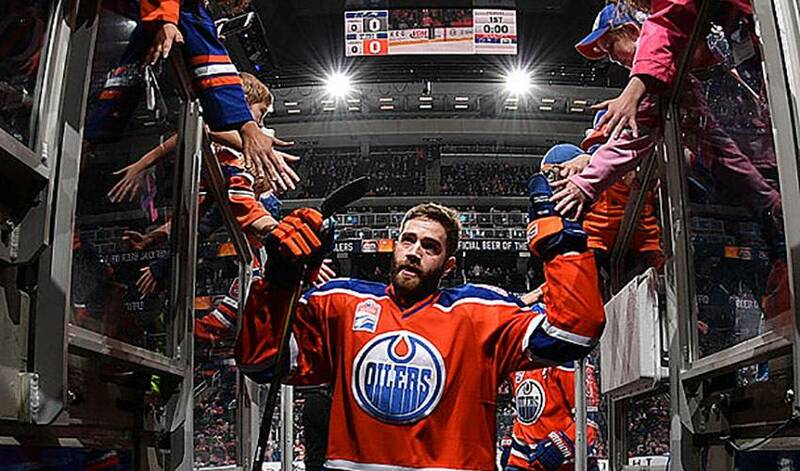 Now with the Oilers, Gryba wanted to remain with the youthful club that has made strides this season and are playoff bound for the first time since its appearance in the 2005-06 Stanley Cup final. Especially with what has transpired 13 months. He suffered a season-ending knee injury in mid-February a year ago and as a result, there were nothing but PTO training camp offers for him last summer. He decided to attend the Oilers training camp and won a roster spot. Now Gryba is a few weeks away from the postseason and couldn’t be happier that his friend’s rumour was just that, a rumour.